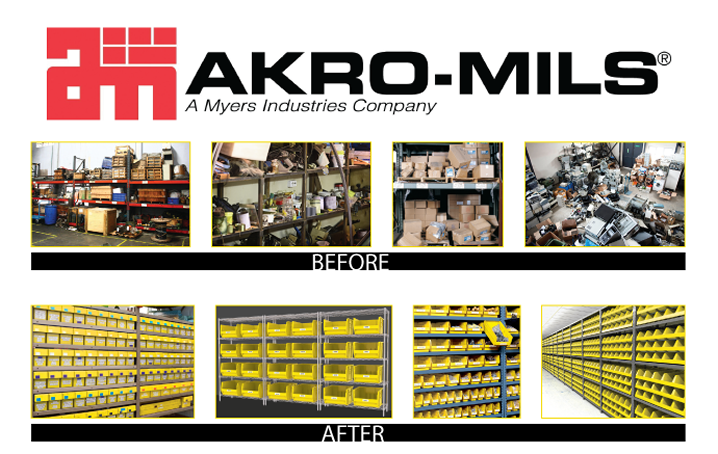 Akro-Mils is a storage, organization, and material handling provider. Akro-Mils were founded in 1933 and are a Myers Industries Incorporation. Since 1947 they have been providing plastic and metal products to help customers with organization and storage solutions. 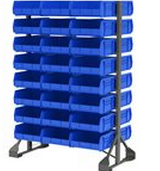 AkroBins Plastic hand and stack storage bins are standard in the industry. The bins are stacked rails, panels, suspend on racks, and stack on shelves. The bins hang from its four corners and increase the storage space on shelving unit. These bins are designed to store and organize bulky products. Attached Lid Containers Lid containers are attached to this container which is made of a plastic material. They are perfect for general storage. 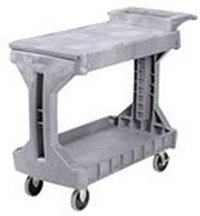 These Heavy-Duty reusable carries are industrial grade and stackable. 23 available sizes available, bins are 8” tall. These totes are 6” tall and maximize your storage capacity with 5 new sizes. 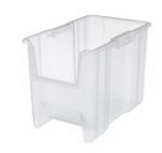 Shelf Bins 4" Replacement costs for this product are reduced and they can outlast corrugated bins. 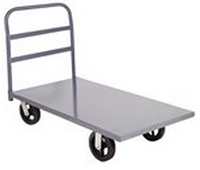 This product makes the transport of bulky items to be easy and convenient. 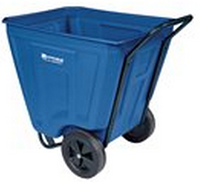 AkroBins 1800 Series This product is designed to handle bulky, large, and heavy items and have a deep pocket. Plastic Cabinets This product has indestructible clear drawers that allow organization of small tools, parts, and hardware. These bins hang and are clear which allow full visibility to contents. Custom made containers that keep contents separated, safe, and secured. Akro-Tubs Food applications are approved for these tubs and are strong enough for the roughest of industrial jobs. Dust free and secure drawer. Protects, covers, and stores any and all contents. 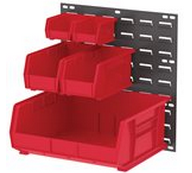 Economy Shelf Bins This product is the only small applications bin that can stack. ESD Containers These bins are produced to protect any sensitive electronic mechanisms. Bin has a restock trigger color which allows you to know when bin needs to be refilled. 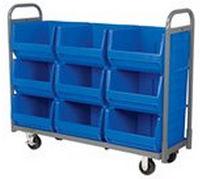 Multi-Load Totes Perfect for AS/RS systems. It is the most multipurpose straight wall container and has available dividers and partition cups. Bins are perfect for bulky and heavy items and have a wide hooper front. Straight Wall Containers Bins are most efficient on trucks and pallets and are offered in either solid or mesh. System Bins This product is a 6 compartment bin and is highly effective in kitting, assembly lines, or work processes. TiltViews Dust free and clear bins that are available in 6 sizes. Provides protection against dust and secures parts more by adding lids to the bins, containers, and totes. Organization is made easy by labeling the bins and totes. Holds bins in place. The brackets allow easy flow gravity hoppers to be attached to panels. Clear Windows fit in the front of the super-sized AkroBins. Allows carts and bins to be added on the ProCart and the steel rail kits attach to the wall. 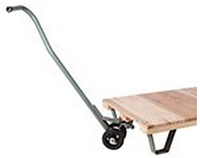 Wood platform truck is made of hardwood deck and kiln-dried tongue; steel frame is optional. 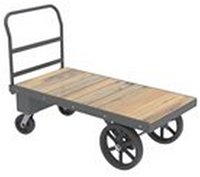 Steel truck rated at 13-gauge, removable crossbar handles, powder coated, and steel deck. Platform truck with structural foam. Available in Medium-Duty or Heavy-Duty also includes gas cylinder trucks. 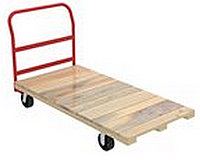 The Heavy-Duty version of the wood platform truck. It is made of a hardwood deck, kiln-dried tongue and powder-coated steel frame. The Work Height Platform Trucks have fixed or adjustable heights. The product provides a convenient workspace that is also mobile. Skids are made of groove hardwood deck with a durable tongue. It can hold up to 2,200 lbs. The louvered systems is a Heavy Duty rated at 16-guage, it includes a powder coated steel panels, bench racks and floor racks. 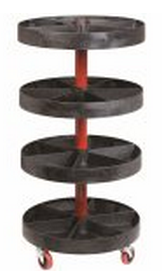 This Wire Shelving starter kit has 4 shelf levels. Wire Shelving Components are available to customize the wire shelving unit levels. Rail Racks are powder-coated and rated at 16-gauge. 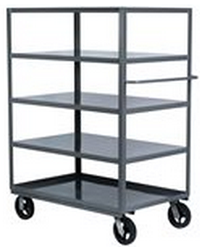 This package includes bins and adjustable steel shelving. Pick Racks are available in single-sided or double-sided. This high-density storage unit has angled shelf levels. 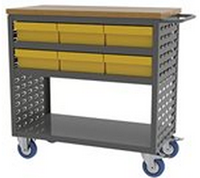 The Akro-Tub Racks have welded steel frames with bolt-on casters. It holds the Akro-tubs and Cross-Stack Akro-Tubs. Wire Shelving & Bins Packages This package includes bins and a wire shelf unit. 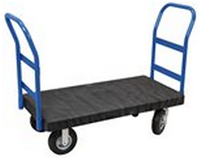 This Heavy-Duty Dolly comes in various designs. The Box Truck is power-coated and available in solid or mesh. The unit is 13 gauge and can hold up to 1,800 lbs. The Akro-Tilt Trucks are great for waste transport. The heavy duty design works great with automatic dumpers thanks to ability to tilt. 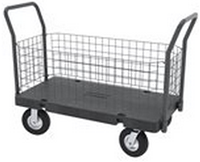 This low profile plastic cart with a wide mouth makes bulk transport easy. 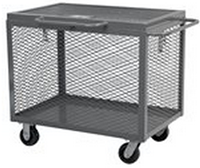 Durable steel, holds up to 2,200 lbs., 13-gauge, and an extra deep tray. 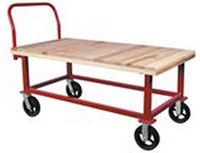 The Table & Shelf Cart ships fully assembled; it is 13-gauge, powder-coated, and holds up to 2,200 lbs. 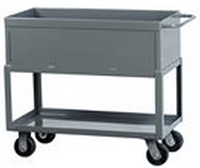 This Heavy Duty cart holds up to 800 lbs., is 16-gauge, powder-coated steel, with an butcher block on top. 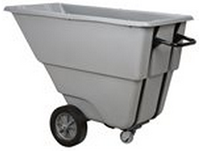 The ProCarts hold up to 400 lbs., they are a lightweight, convertible, rust-proof utility cart. 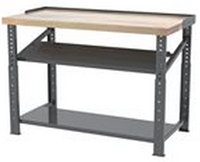 The Work tables and benches are industrial-grade and made with a durable powder-coated steel. With this Handled Cart the Super-Size AkroBins are now mobile. The Tool & Tote Caddies are great for medical, industrial, and home use. They are an easy way to store tools or supply organization. 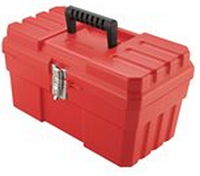 A heavy-duty toolbox or craft supply box. This compact unit has 24 compartments and a mobile rotating stand. 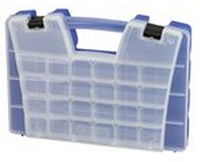 This portable organizer is great for small parts storage such as screws, hardware or craft supplies. The case snaps closed for stress-free mobility.